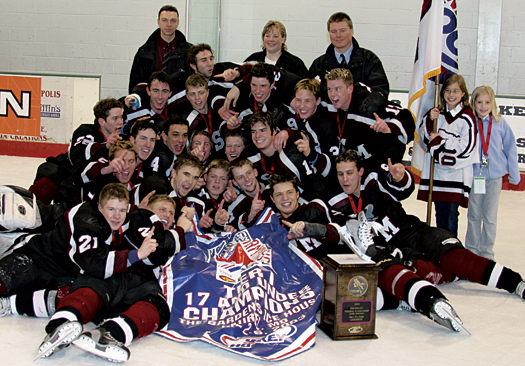 Players from the Shattuck-St. Mary’s team that won the 2003 USA Hockey Tier I 17 & Under National Championship crowd around their winnings in Laurel, Md. The walls inside Tom Ward’s office are plastered with photos and mementoes from his 11 years of coaching at Shattuck-St. Mary’s prep school. Looking around the room, Ward can proudly recall the people and teams that have made his time at the Faribault, Minn., prep school fly by. “I sit here in my office and look around and there are five of these teams that won national championships,” said Ward, the director of hockey and head coach of the boys’ Midget AAA program. If special can be measured by degrees, one team photo would stand out above the rest. It features the Shattuck-St. Mary’s squad that captured the 2003 USA Hockey Tier I 17 & Under National Championship in Laurel, Md. A closer look at the names under the photo would make any hockey coach drool. There’s the baby-faced Ryan Duncan, the 2007 Hobey Baker Award winner, stretched out in the front row. Huddled around the USA Hockey championship banner to the right is Matt Smaby, the hulking defenseman who is in his third year with the Tampa Bay Lightning. Over his shoulder is Buffalo Sabres standout forward Drew Stafford. Jack Johnson, most recently of the silver-medal winning U.S. Olympic Team, crouches nearby, smiling from ear to ear. The best of friends at Shattuck-St. Mary’s, Jack Johnson, left, and Sidney Crosby have crossed paths on NHL and Olympic ice.Sandwiched in the tangled web of smiles and index fingers thrust in the air are Brian Salcido and Matt Ford, who are currently playing in the American Hockey League. And right in the middle of it all is a bright-eyed Sidney Crosby, who won a USA Hockey National Championship long before he captured a World Junior Championship title, captained the Pittsburgh Penguins to the Stanley Cup or raised his hero status to new heights by scoring the golden goal for Canada in the 2010 Olympic Winter Games. 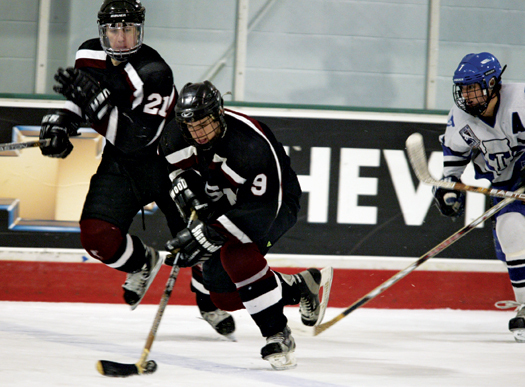 Over the years Shattuck has produced more than its share of skillful players, from college stars to NHL standouts. A lot of the credit goes not only to current coaches like Ward, Murray Eaves and Gordon Stafford, but to J.P. Parise, who took the program to new heights when he was hired as hockey director. To keep up with so many of his former players, Ward recently bought the NHL Center Ice package. All he needs now is a comfy chair and a quick remote finger to flip from game to game to find some sort of Shattuck connection. “I go to bed with a smile on my face after watching these guys play on TV. It’s a pretty neat thing,” said Ward, who an assistant coach on the U.S. Team that won the gold medal at the 2010 World Junior Championship. That smile grew even bigger this past February as a total of seven Shattuck-St. Mary’s alumni were skating in the Vancouver Olympics. In addition to Johnson, the U.S. squad included Ryan Malone and Zach Parise. The Canadians had Crosby and Jonathan Toews, and the U.S. Women’s Team featured the Lamoureux twins (Jocelyne and Monique). Sidney Crosby skates up ice with Ryan Duncan for St. Mary's. For Crosby, who came to Faribault carrying some heavy baggage, his year at Shattuck laid the groundwork for what will surely be a Hall of Fame career. With the rest of the Canadian hockey world breathing down his neck, Crosby did the unthinkable and migrated south to play for Ward, who had coached the young phenom the year before at the Mac’s Midget tournament in Canada. “In Canada I wasn’t able to be on the ice as much as I can here. I knew coming to Shattuck would mean that I could work hard on my skills every day in practices,” Crosby said in a 2002 article in Minnesota Hockey Journal. Ward did his best to treat “The Next One” as any other wet-behind-the-ears player looking to gain a roster spot. Crosby asked for, and received, no quarter from Ward or the rest of the coaching staff. Even with Ward rolling four lines, Crosby still managed to amass 72 goals and 162 points in 57 games, including 10 goals and 8 assists in six National Championship games. “At the time Sidney and I were the two young kids on the team. We were the two 10th graders,” said Johnson, who went on to play at the National Team Development Program in Ann Arbor, Mich.
More importantly, Crosby gained lifelong friends that he continues to be close to today. 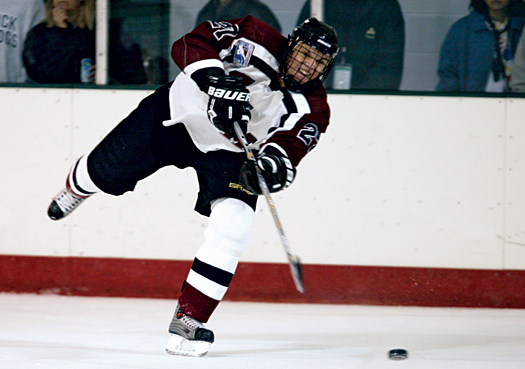 Matt Smaby is in his third season with the Tampa Bay Lightning, but fondly remembers his years at Shattuck-St. Mary’s. 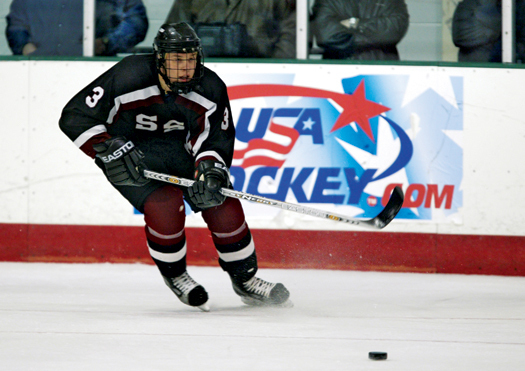 By the time Shattuck arrived at the Gardens Ice House in Laurel, Md., for the USA Hockey National Championship tournament, Ward had his squad firing on all cylinders. Loaded with a number of players who were still stinging from their semifinal loss the year before to Team Wisconsin, the Shattuck team bus rolled into Laurel with one thing on the players’ minds. “We played a lot of games during the year, played in some big tournaments … but the National Championship was the thing we shoot for every year,” Smaby recalled. They opened with a 7-4 victory over the IMG Hockey Academy, and followed it up with a 7-3 dismantling of a powerful Little Caesar’s team. As Shattuck began to pull away in the second period, things quickly got out of control. It ended with forward Jacob Hipp being carted off on a stretcher after a checking from behind penalty with only eight seconds left in the game. The injury seemed to galvanize the Shattuck squad, who went on to skate past the Alaska All-Stars, Eastern Mass Senators and Dallas Stars despite falling behind early in all three games. In the finals, Shattuck faced an old foe in a talented and determined Team Illinois. It proved to be a battle from the opening faceoff. After trading first period goals, Shattuck pulled away in the second on goals from Crosby and Duncan. Team Illinois peppered Shattuck goalie Mike Mayhew, who went on to play at the University of Michigan, with 11 shots in the third period, sneaking two past, but Duncan and Stafford countered to put Shattuck on the winning end of a 5-4 decision. The victory marked the third title in six years for Shattuck, which has gone on to claim three more in the following years, and helped take away the sting of losing the previous year. “It was huge. It was my senior year. It was my last shot with these guys and being in a national championship. It was such a great feeling,” Stafford said. Jack Johnson back in his St. Mary's days. Despite their individual successes in the years that have passed, this group of players remains tight to this day. 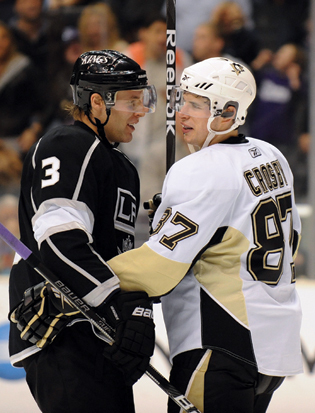 They continue to follow each other’s careers and catch up whenever their NHL teams hit the ice. Even Crosby, for all he’s accomplished at such an early age, has never forgotten his one magical season in Faribault. When Ward brought another Shattuck squad to Nationals in Pittsburgh, Crosby invited the entire team to be his guest at the Penguins’ practice facility. “For him to even acknowledge that we were there and to let the kids know that he was thinking about them was special,” Ward said. That camaraderie is alive and well today. It lives on in the photos on Ward’s office walls, in the NHL games he watches nightly, and in the hearts of 20 hockey players who arrived on the Faribault campus in the fall of 2002 and left as a band of brothers with a bond that will withstand the test of time. “Winning a National Championship tattoos these guys. All these years later, they’re thicker than thieves,” Ward said. “Shattuck is a place that we all manage to get back to at some point during the year,” Johnson added.